“Diversify the economy” is Alaska’s rallying cry as oil production and prices sink. First of its kind Alaska tech accelerator Launch : Alaska wants to put the idea into action with the hot-ticket item of booming Lower 48 metro areas. The program combines Anchorage municipal goals to draw more diverse businesses into the city with private investment. Five startups from Alaska, the Lower 48 and South America each received $25,000, office space at The Boardroom, housing, networking opportunities, and professional advice from a pool of mentors including former Lt. Gov. Mead Treadwell, Alaska Industry Development and Export Authority Executive Director John Springsteen, and a slew of capital investment and tech development experts. On Aug. 25 at the end of the 90-day program, the teams will each pitch their developed products to investors in Anchorage. In return, the incubator gets a 6 percent share of the companies’ eventual profits, in the meantime hooking the founders on Alaska’s quality of life points to keep them here. Lower 48 cities and companies commonly use tech accelerators to get a share in potentially lucrative mobile apps and technology platforms. More than 300 exist in the U.S. Launch: Alaska planned to incubate technologies with applications relevant to Alaska’s unique needs in the Arctic and energy development areas. Some of the five have clear ties to this focus. Aquilo, based in Fairbanks, is creating new technologies for drone flight, which has broad applications for both research and operations purposes for Alaska’s key industries. Roborzoid is a voice recognition platform that can connect voice commands to objects ranging from microwaves to oil derricks for remote and hands-free control. The creators, from Carnegie Mellon University in Pittsburgh, say they can adapt this kind of software for more than the current user demographic. The voice recognition software could have potential North Slope engineering and telehealth applications, and the creators said they have already had discussions with Alaska companies interested in the platform. Other accelerator startups have less apparent focus on Arctic work and energy development but do have applications for Alaska’s outdoorsy and rural residents. Heather’s Choice is an Anchorage-based food box delivery service in the vein of Nature Box that focuses on outdoors meals. Kwema, a Santiago, Chile-based startup, is developing wearable technology for women’s safety. Lance Ahern spearheads the program. Ahern has background in both tech development and in municipal public affairs. He founded Internet Alaska in 1994, then left for Silicon Valley in 1998 to found Fort Nocs, an online merchant infrastructure system. Most recently, he worked as the Chief Information Officer for the Municipality of Anchorage and as a business advisor for the Alaska Small Business Development Center. Ahern wants to address the common Alaska brain drain problem that plagues tech even harder than other areas. “We just keep seeing great people leaving and doing what they were going to do here anyway, just doing it somewhere else,” Ahern said during a June 30 networking event thrown for the accelerator teams. Anchorage is hardly synonymous with tech startups more likely to be found in the San Francisco Bay Area, Seattle, Austin, or New York City. 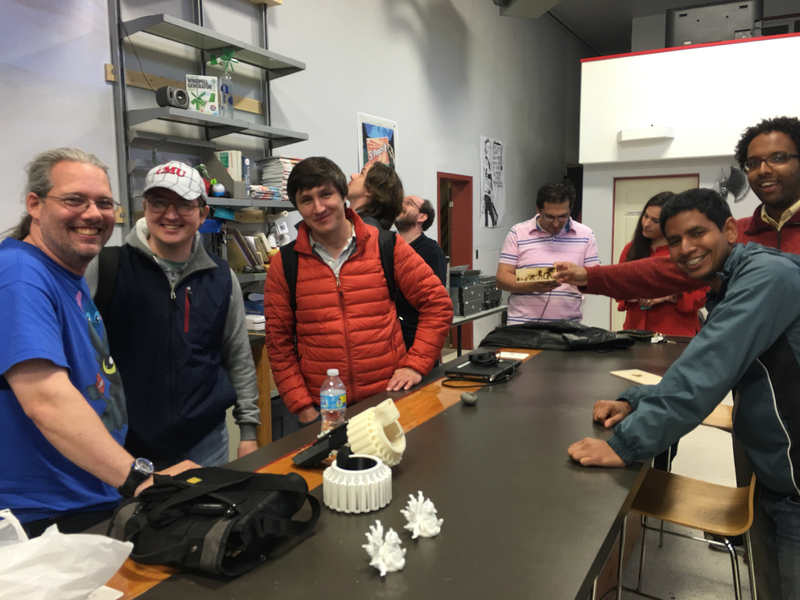 In hopes to draw innovators to the city, the program hosts team events to attract startups to Alaska’s natural beauty. A hike along the Powerline Pass trail at Chugach National Park, Ahern said, was a hit among the teams. Perhaps more importantly, Alaska offers lower business expenses than tech-heavy Lower 48 centers. California’s flat 8.84 percent corporate income tax rate is eighth-highest in the nation, according to Tax Foundation, while Alaska ranks as the third best state for business tax rates. Alaska’s corporate income is progressive, from zero percent for companies with less than $25,000 in income to 9.4 percent for those with more than $222,000, a boon for upstart companies with limited capital. A bevy of other taxes typical to California have no Alaska equivalent, or do not apply to small businesses. Further, while Anchorage’s office rent is higher than the national average it pales in comparison to New York City or Silicon Valley. Startups can theoretically house their development teams here for a fraction of the cost of more traditional tech centers. Ahern himself left Alaska for Silicon Valley in the late 1990s just before the dot-com bubble burst in 2000. Like others, he said he would rather have remained in Alaska but simply didn’t have the option. Ahern’s problem was business infrastructure. Tech startup must-haves like venture capital funding drove him and other tech founders into more established markets. Ahern’s mind is dotted with examples of ideas drawn away from Anchorage in search of investment dollars. “This is a guy who just raised $30 million, this guy’s partnering with Amazon now in Austin, this guy’s building his second security software company in Washington, D.C. There’s no reason they couldn’t have done this here, but the local ecosystem hasn’t been ready,” he said. After 15 years, however, Anchorage’s business landscape looks far friendlier to tech startups. Apart from partnerships with The Boardroom to provide working space and housing at the University of Alaska Anchorage, the program has congealed disparate Alaska investors into a single focused program. The prospect of a tech accelerator, initially begun with a Small Business Administration loan, picked up steam and now involves a host of Alaska investors. Alaska Growth Capital, Native corporation Cook Inlet Region Inc., and individual angel investors now pitch in for the total cost along with the Alaska Accelerator Fund. The Alaska Accelerator Fund is a seed capital fund created by individual community investors and the Municipality of Anchorage’s 49th State Angel Fund. The city of Anchorage established this fund with $13.2 million grant from the U.S. government to invest in small local business and startups.